COMPLETE ROLL CAGE PAD SET (10 PADS). Protect yourself and give your Rhino that custom look. Crafted from a thick medium density foam pad wrapped in all weather, UV treated, water and dust resistant nylon. Features a heavy duty hook-and-loop closure for easy installation. Set Includes two front, four rear center, two rear outer, and two roof pads for a total of ten pieces! 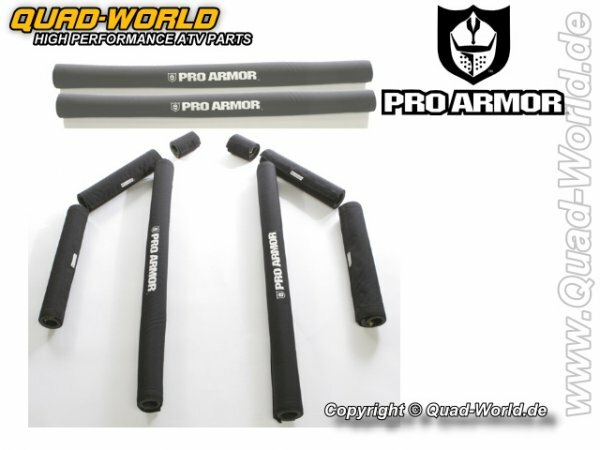 Weiterführende Links zu "Pro Armor Complete Roll Cage Pad Set 10 Stück für Yamaha Rhino"
Kundenbewertungen für "Pro Armor Complete Roll Cage Pad Set 10 Stück für Yamaha Rhino"